The population is over 3,977,000 people. It’s size is 51,130 Sq km. 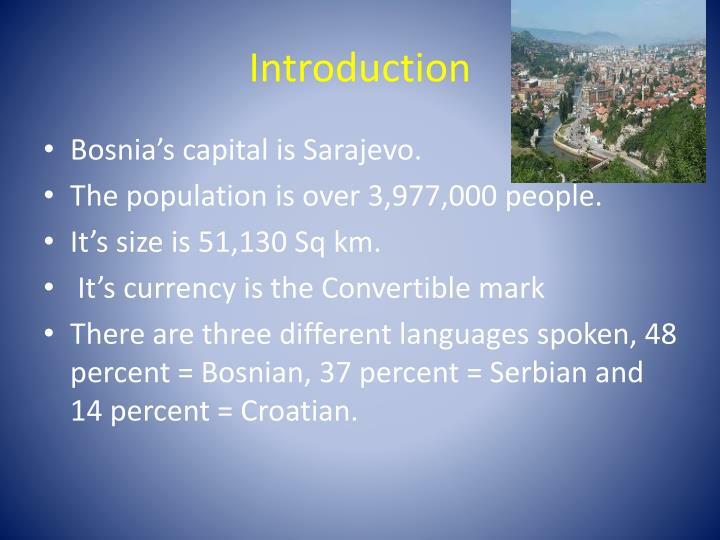 There are three different languages spoken, 48 percent = Bosnian, 37 percent = Serbian and 14 percent = Croatian. 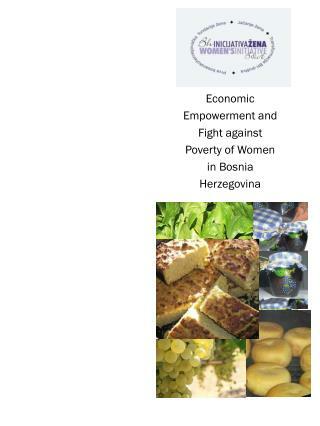 Bosnia is famous for it’s spices and sauces. They have most of the same food we have. 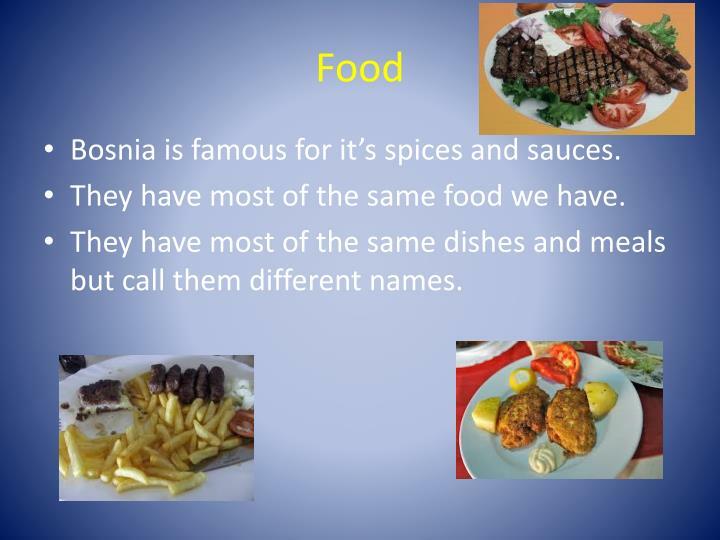 They have most of the same dishes and meals but call them different names. 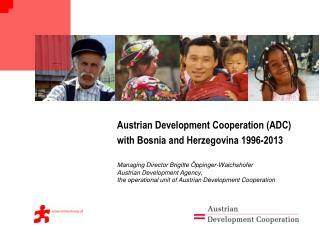 AlijaIzetbegovic was the first president. 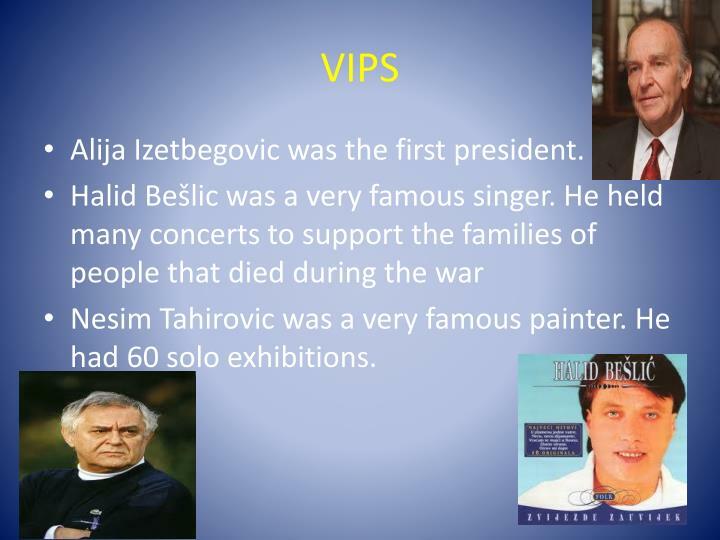 NesimTahirovic was a very famous painter. He had 60 solo exhibitions. 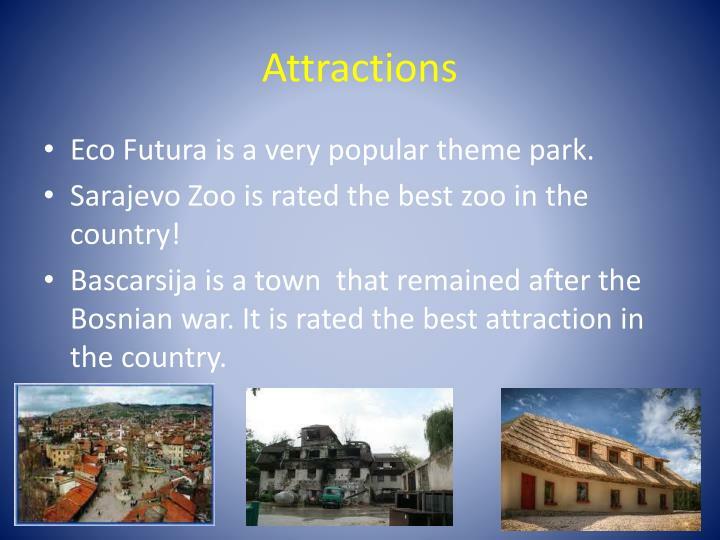 Eco Futura is a very popular theme park. 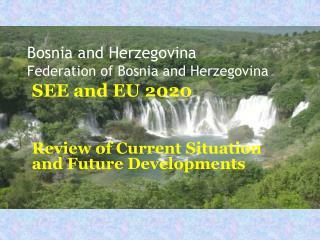 Sarajevo Zoo is rated the best zoo in the country! 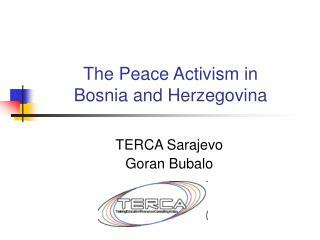 Bascarsija is a town that remained after the Bosnian war. It is rated the best attraction in the country. 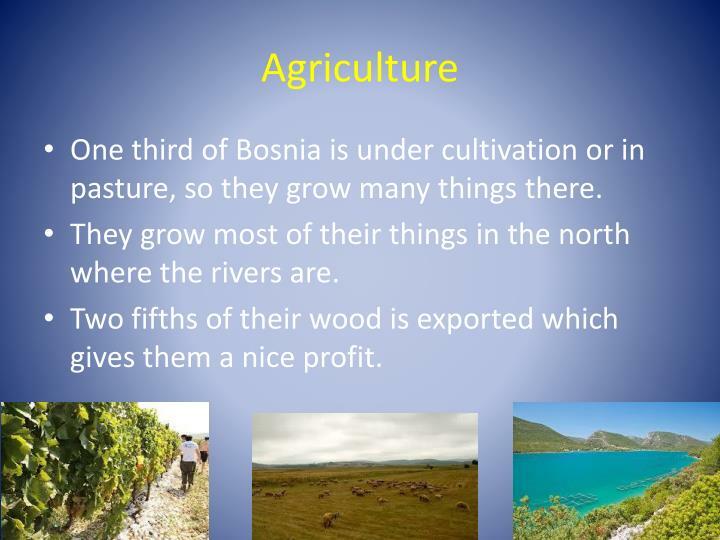 One third of Bosnia is under cultivation or in pasture, so they grow many things there. 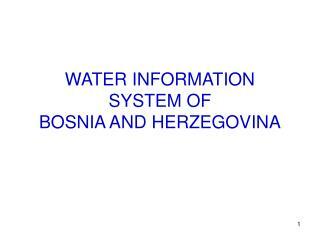 They grow most of their things in the north where the rivers are. 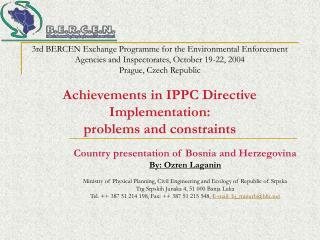 Two fifths of their wood is exported which gives them a nice profit. 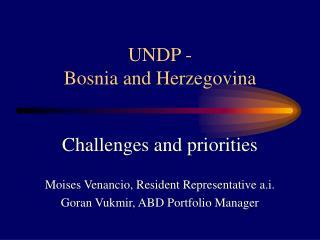 Bosnia have nine festivals that only they celebrate! 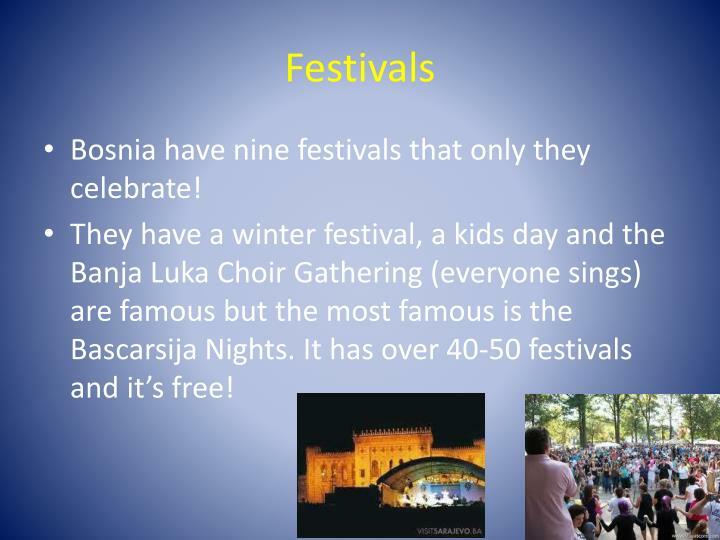 They have a winter festival, a kids day and the BanjaLuka Choir Gathering (everyone sings) are famous but the most famous is the BascarsijaNights. It has over 40-50 festivals and it’s free! 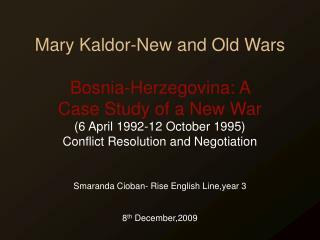 The Bosnian war started because the Croatians and the Serbians wanted to get rid of the Bosnians from Bosnia. 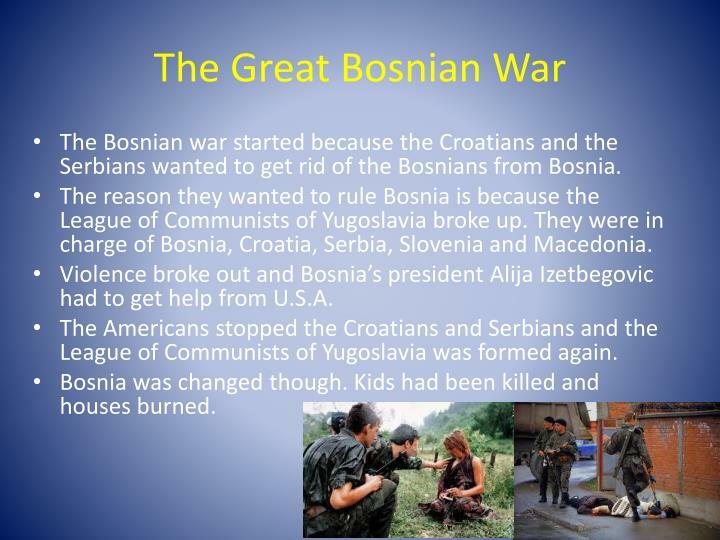 The reason they wanted to rule Bosnia is because the League of Communists of Yugoslavia broke up. 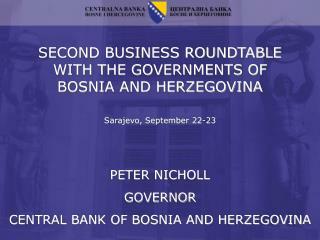 They were in charge of Bosnia, Croatia, Serbia, Slovenia and Macedonia. 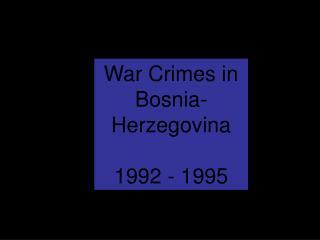 Violence broke out and Bosnia’s president Alija Izetbegovic had to get help from U.S.A. 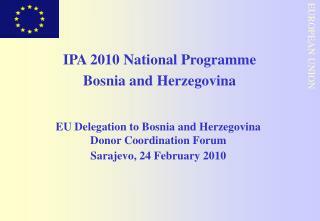 The Americans stopped the Croatians and Serbians and the League of Communists of Yugoslavia was formed again. 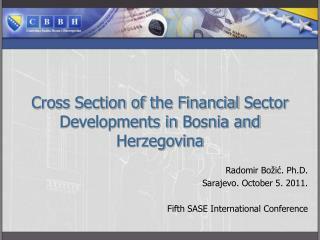 Bosnia was changed though. Kids had been killed and houses burned. 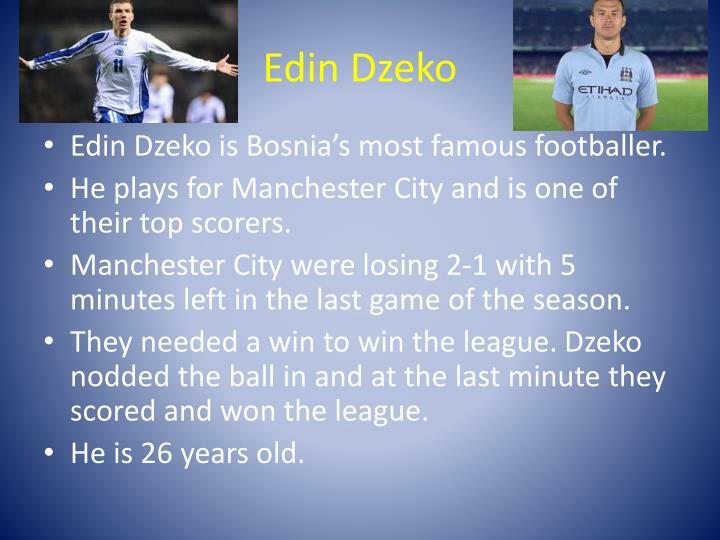 EdinDzeko is Bosnia’s most famous footballer. He plays for Manchester City and is one of their top scorers. Manchester City were losing 2-1 with 5 minutes left in the last game of the season. They needed a win to win the league. 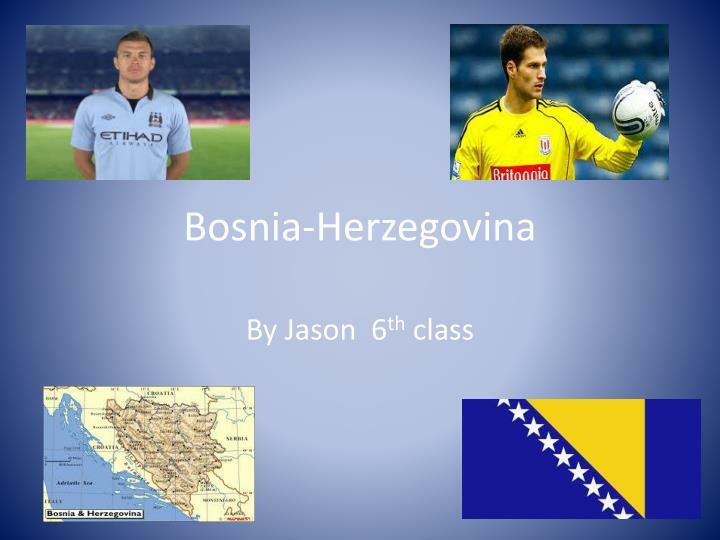 Dzeko nodded the ball in and at the last minute they scored and won the league. 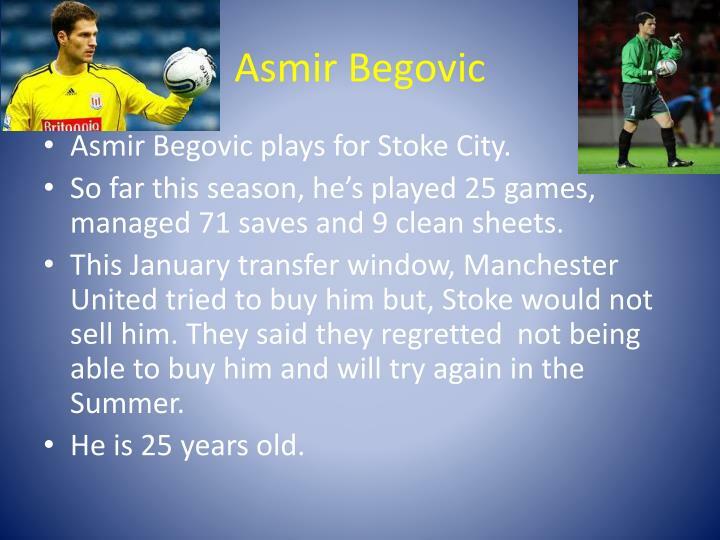 AsmirBegovic plays for Stoke City. So far this season, he’s played 25 games, managed 71 saves and 9 clean sheets. This January transfer window, Manchester United tried to buy him but, Stoke would not sell him. They said they regretted not being able to buy him and will try again in the Summer.